Celebrate new ideas and make connections with art and the community at the San Jose Museum of Art. At noon on the first Wednesday of each month, Lunchtime Lectures feature artists, scholars, and other expert speakers who explore topics related to SJMA’s exhibitions or trends in the cultural community. Bring your lunch or grab a bite from Café Too. Free with Museum admission. What do terms like “creative placemaking” and “social practice” mean in the context of public art, and how are they shaping the built and living environment in San Jose? Jennifer Easton, public art director for the City of San José, will discuss some of the current trends and challenges in public art. February is Black History Month, and with the attention of the sports world on the Bay Area thanks to the big game, it is an appropriate moment to look at San Jose’s legacy of civil rights activism through sports. Urla M. Hill, who guest curated the 2007 exhibition Speed City: From Civil Rights to Black Power at History San José, will discuss the history of athletics and activism at San Jose State College (now San Jose State University). As seen in Richard Misrach’s photographs in the exhibition Border Cantos: Richard Misrach | Guillermo Galindo, walls and fences can have environmental as well as human impact. Hear about life in the communities that contain border walls from Dan Millis, Borderlands program coordinator of the Sierra Club. An advocate for the environment and human rights on the border, he will look at wildlife, nature, and the communities that exist in the US-Mexico borderlands. Find out what individuals can do to help them thrive. The traditional arts of Japan include a number of visually dynamic forms, traces of which can be seen in the work of Tabaimo, the subject of the exhibition Tabaimo: Her Room. Karen Fraser, assistant professor of Asian art in the Department of Art and Art History at Santa Clara University, California, will introduce two of the best-known forms of performance art: Bunraku puppet theater and the stylized Kabuki theater. Lynn and Harry Powers are longtime dedicated San Jose residents: they have lived and worked in the city and, for many years, taught at San Jose State University (SJSU). Works by both of these artists will be featured in the exhibition Artists in Residence: San Jose’s 20th-Century Vanguard. Each is individually respected. 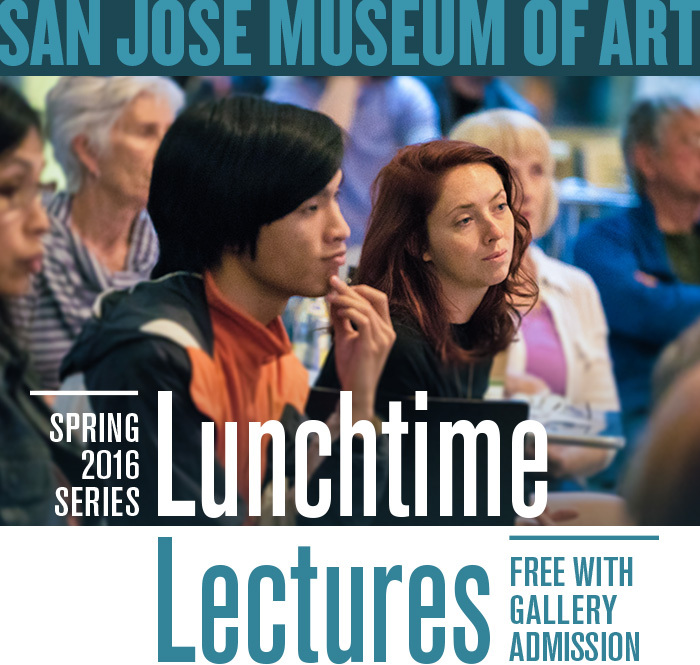 Together in this Lunchtime Lecture, the Powers will share their personal reflections on the generation of artists that influenced the San Jose Museum of Art, SJSU and city’s art scene. Don’t want to brown bag it to the lecture? Order your lunch ahead from Café Too at SJMA and enjoy it during the talk. Try seasonal favorites such as the fig-marinated pork loin sandwich, butternut squash and pear bisque, or harvest salad, or check out the weekly specials. Click to see menus and specials. Call 408.277.0557 to order.